I first heard this recording as I was being driven by my friend Stuart Douglas, Alex Campbell’s cousin, round Lake Ontario on the way to Toronto. He put a cassette into the player, without saying a word, and I was amazed to hear Sandy Denny and Alex swapping songs and chatting away. Stuart had found the tape in Glasgow in Patsy Campbell’s house after she died but, as a cassette, it was unusable for release. 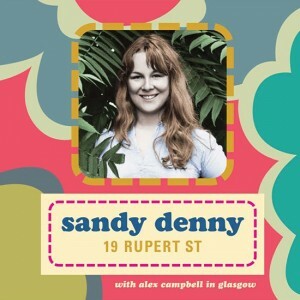 Then last year I went to a meeting in Copenhagen and afterwards a guy came up to me and said that a friend of his had a tape of Sandy Denny that he’d recorded years ago in Glasgow. I wrote and asked if I could have a copy and a few weeks later, much to my amazement, the original tape arrived through the post. 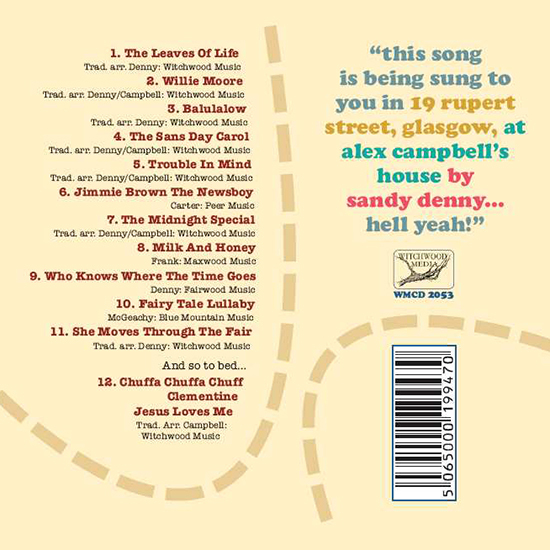 It was recorded at 19 Rupert Street, Glasgow, Alex Campbell’s home, on 5 August 1967 on a quarter track domestic machine. I took it to Abbey Road to have it transferred to digital, and I was stunned to hear Sandy and Alex singing, laughing and joking as though I was in the room with them. I edited and mastered it with legendary producer Chris Tsangarides. It’s what it is, a home recording, but what atmosphere!